My first contact with Dorado on a fly rod was on my #7 weight and were Doradillo as the small ones are called, weigh up to 2 kilos or 4 lbs. And they were a staggering experience on this rod! The tiny little, barely 1 kilo or 2 lbs. fish were bending my rod, which I normally used for much bigger fish, fighting furiously, jumping and leaping in the air. I was on the Uruguay river in Argentina, giving myself a rest after having returned from the dusty experience of “Ruta 40” and the hot and mosquito spoiled Chaco in Paraguay. Ever since I finally settled down my restless soul in Argentina, the Dorado has become my most wanted in Argentine waters! Carolina and I live just a twenty minute ride away from the Lake Salto Grande, a huge man made reservoir build in the late 70’s to generate energy. You can read much more about Heiko’s and Caroline’s fishing in Argentina on their web site Latitud Sur Anglers. 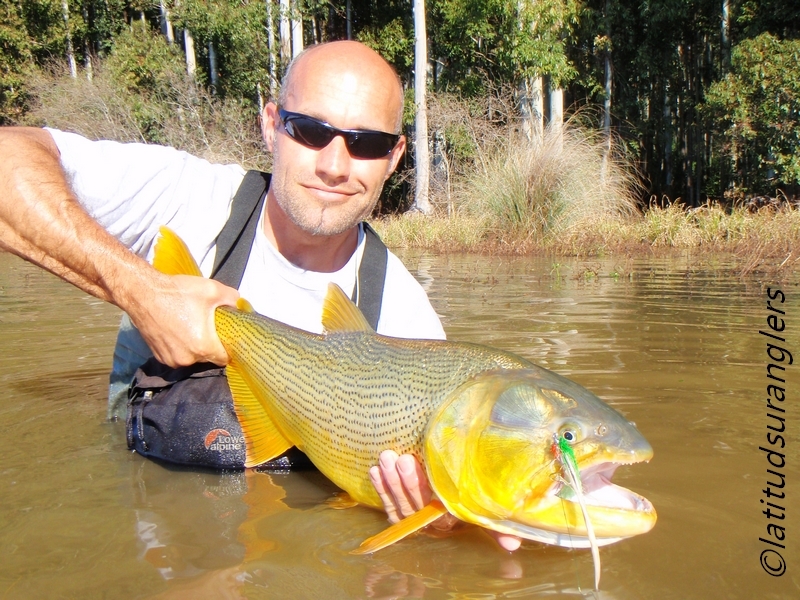 The Dorado is known to be caught in the big streams like Parana, Paraguay and Uruguay rivers and the enormous confluence of Parana and Uruguay rivers, called Rio de la Plata as well as crystal clear creeks further north. Not to forget those unique marshes Isoro and Ibera. The most common technique is trolling big artificial lures and live bait like the Morena, an eel like fish. Since the “Gringos” came in the 90’s the fly rod has become a new invention to fish for Dorado, but it’s still a rarely seen technique for the locals. The hunting habits of Salminus isn’t similar to the salmonids but their resting behavior and their preference for shelter is much like what’s seen in trout. So we admit that even a relatively inexperienced fly fisher can figure where to find Dorados in a river. But how does it work in a lake? That’s where our story begins : Stillwater fly fishing for Golden Dorado without floating devices. We are faced with a huge plain of water, fjord-like branches, lagoons and swamp-like vegetation. There are no tributaries, estuaries and no meandering with undercut banks. We won’t find oxygen enriched white water, which drops into a deep pool. So, how to figure the proper place and time to fish? The force of mother nature? Would it be more successful during summer when temperatures raise up to 40°C? Or would a be more advisable during winter, when the water temperature drops down under 20°C? It sounds mysterious, but its not: since the lake is artificial and the water is used to generate energy, the water level varies up to 10 meters or 30′ and “28”means the depth! And here we go, stuffing our daypack with the essentials like Yerba Mate, the Argentinian’s beloved tea, served in a calabash gourd with hot water and a metal straw. So equipped we chucked around to explore the lake bottom. And it revealed its secrets: most of the banks are packed with stumps in bizarre shapes, the remains of the forest before flooding, and now shelter for all kinds of minnows. Sandbanks, gravel ground and deep pools. But the most important conclusion is the dense aquatic vegetation which reaches up to twenty meters into the lake. We were getting closer to the Dorados! It was a calm overcast early spring day. We were getting our tackle ready. Carolina was fishing her 5-weight three piece rod and I went for my ancient #4–6 two piece rod. Floating lines, knotted homemade leaders and 5 kilo or 10 lbs. bite tippet. Should be all right, we hoped, to get some small Dorados. As we arrived the sky cleared up and the sun had come out, giving the lake a warm gentle appearance. We started casting our lines close to the weed beds and after a while I had my first take. I am still amazed how violent even the small Dorados attack the fly. Shortly after Carolina had her first take and released a nice Doradillo. We were casting persistently our way down to a small lagoon lined with dense reed. A glint of gold breaking the surface. Flap, the size 1/0 fly touched the water and disappeared. Some strips later, the take was significantly different from the take before. Almost immediately a golden majestic body emerged out of the deep and fell back. I estimated this fish a bit bigger than those before, slightly, but somehow, bigger. 0.35 millimeters leader and a 5 kilo or 10 lbs. bite tippet. Jerk which you are, how you dare to fish such light tackle!? It took me some nerve-wrecking minutes to get back all my line, which was way out in the backing. I literally had no working brake on my reel, so I just kept tension to avoid any slack in the line. I tried to get myself in a good position for the final move, but the lake bottom was muddy and slippery and I decided to fighting my ground in the waist deep water. When the fish came in sight, he was moving like a shark exploring some reef, the tail and dorsal fin exposed out of the water. Then I realized that it really was a good one. The sun was setting and turned the sky into warm orange colors while we carried on fishing the lagoon. Carolina landed her first real Dorado and released him as well. The Dorados were feeding erratically, but there was a difference. Usually you won’t miss a striking Maxillosus, splashing and violently hunting on the surface, but here the fish were rolling and it seemed that minnow were rather sipped in stead of torn apart. Just one Dorado was hunting down a Sabalo into the reeds. But more surprisingly, despite our small flies – the length didn’t exceed 8 centimeters or about 3 inches – these patterns were not refused. Carolina caught several more nice Dorados this evening, and it ended as predicted: after a strike like a sledgehammer I lost my fly including the bite tippet. With this experience in mind we never again left home without heavy back up gear. And be sure enough: when the water temperature has been summer-like, those Dorados would have trashed all our equipment! All fishing rises and falls with the water level of this reservoir, and the rules are: go when the number is between “35” and “30”. All Dorados we have caught, and there are very few exceptions, have been caught sight fishing and stalking. When the Dorado is feeding on the surface, present the fly directly into the battlefield. There is a 99% certainty he will take the artificial. We were never lucky seducing a Dorado, which was active hunting prey on a shallow shoreline. It might be the missing sensitivity because of the depth. Just a guess. When not chasing any snack, Dorados like shelter. Logs and boulders are absent, so they hide close to or even in the weed beds. The fly must be presented close to these resting fish. Even bushes and trees are hotspots. Another important feature is the “splash”. We want the fly to land hard on the water and always instantly strip in your line. That’s meant for all fishing situations! There seems no predictable sign or circumstances for Salminus‘ feeding habits. Strong wind, sunny days, overcast. The Dorado always feeds on some minnow, although we never hooked a Dorado after dusk. Another fact is that the bigger ones don’t hunt on the surface, except during spring time when the cold water, around 16 degrees Centigrade, is slowly increasing in temperature. And they are often hooked in deeper pools. You might have wondered why we never mentioned any sinking or sinktip lines. We don’t use them! The only secret we have in order to get the really big ones is to trigger their attention! Either in the open or in the deeper pools: big flies, which push a lot of water, weighted and preferably with silicone heads are the weapons of choice. One very important advice for all who might fish for Dorado some day–or already do: don’t land the fish with such devices as Boga Grips! You will puncture the lower jaw or in the worst case totally rip off the skin, which makes the Dorado vulnerable to the fungus acromycosis and even handicapped when feeding! The safest way to land a dorado if you can’t use a net, is to “hand tail” it, grabbing it right in front of the tail. Hand tailing requires a bit of practice and that you know how to handle your rod in the final phase of the landing. You have to bring your rod tip sideways behind your head. A sudden move from a big dorado could be the last move for your rod tip! Once landed quickly release the fish again. Because of its fighting habits it will, unlike many other species, easily suffer from mesocosm exhaustion with a highly increased level of lactic acid in the muscles. The higher the water temperature the faster you need to drill the dorado to ensure a quick recovery! What fly to use, or what are they going for? The extraordinary amount of Mojarras or Mojarritas. Three different species are found in the Salto Lake, but Astyanax faciatus, a small piranha-like fish is the prey number one. Its fertility, depending on water temperature, allows this fish to spawn up to ten times a year. Number two in the food chain is the Sabalo, Prochilodus platensis, a whitefish similar to the european Carp, which grows up to 6 kilos. Those are the “meal priority”of the Dorado, followed by all the other food sources, like frogs and even Dragonfly nymphs! Because of its muddy stain, the flies we are going to use don’t have to be exactly a natural duplicate. Size, proportions, volume and color are the most important issues. In general 0/1 – 5/0. Most used is 3/0. Muddler style patterns are our first choice in terms pushing water. A fairly big number of the flies are weighted either with lead eyes or bead chain eyes. I like to combine all traditional materials like bucktail, peacock herl, Kaiken collar feathers with all kinds of synthetic stuff. Even epoxy and hot melt glue has proved to be useful. I am using a broad variety of colors: white, chartreuse, red, yellow, green, black, gray and all kind of glitter. Another good and and sturdy way is forming the head out of silicone and the body itself from synthetic hair, this is an surprisingly light solution: it even floats tied on a 5/0 hook attached to 10 kg bite tippet! It just needs a strip on the line to get it down where the big ones lurking. As I wrote, our tackle on this particular day wasn’t appropriate. A normal setup would have been #7 rods and much stronger leaders and bite tippets. But on the other hand we have been fishing the small ones with #4 rods. Carolina chooses between her #5 9 ft. 3 piece And #7 9 ft. 3 piece rod. I don’t have any rules respecting my rod choice. To gain distance with bigger flies I prefer my #7 9 ft. two piece with backbone. For the inshore fishing, which is the most common type of fishing, I like to use my #6-7 9 ft. 4 piece rod. And then there is my adored #4-6 9 ft. rod. A two piece miracle in terms of stiffness and ability to handle different line classes. Most casting is done at a distance between 5 and 15 meters from casting positions in knee to chest deep water. And very often with very limited space for back casts. In order to bring out the required amount of line attached to rather big flies I overload my rods up to two line classes. All lines used are WF. We use homemade knotted leaders. The Albright and blood knot is my choice to make the knotted leaders, even the slim beauty has proved itself useful. To connect the knotted leader with the fly line I am using the Perfection loop. Honestly, I’m going to award a prize to those who finally solves this crux! It hurts to loose a nice Dorado or any other toothy critter, because of a snapped mono-to-bite tippet connection. I am a sort of a “light weight tackle big fish stalker” when it comes to use my smaller flies and lighter #4 or # 5 weight rods. And therefore i usually prefer homemade knotted leaders with 0.35 millimeters mono tippet to knot on the 5 kilo multistrand plastic coated bite tippet. But then you’d better watch out, because any hangup – and there will be a lot – will cause a tremendous stress for your leader-to-bite tippet rig. The rather thin wire leader will weaken the mono and in the end break. Finally, or luckily I tend to say, because until this will happen you are faced with another annoying fact: a crinkled and twisted piece of crap called bite tippet! Another option is the use of piano wire. I gave it a try in 0.30 up to 0.40 millimeters diameter, but in my eyes it’s just another compromise. It gets curled as well. The almighty Titan bite tippet. This is so far the only competitor, which survives all abuses. Like the piano wire you have to prepare each single piece of wire with a loop to connect the mono and a additional one for the fly.I don’t like this bulky stuff either. I hardly make a decision what flies to carry. I prefer them all… which is impossible. And another point: they are not easy to store in a way that I like it. Yes, it’s just another compromise. Well, that’s the final hassle in our “line game”. I like to use them. They come in dozens of types, but still I try to avoid using them for the trophy Dorados. Let’s say that I trust them for our lake beauties up to 2 kilos. Not because the snap will break. No, the bigger the Dorado the more powerful the jaws and the more likely a loss because somehow the snap will be opened up. So, what bite tippet to use and which knot to tie? Different kinds of bite tippets and knots have proved to be worthwhile and wise choices, but none is useful for all applications. Each of them will work in a certain way, but will be a compromise in others.